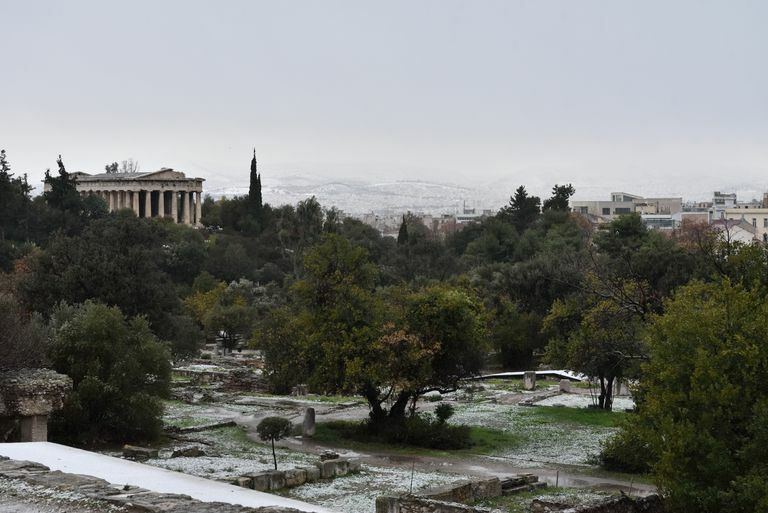 Temple of Hephaestus with snow on December 29, 2016 in Athens. Greek temples are the Western ideal of sacred architecture: a pale, soaring but simple structure standing on the hill in isolation, with a peaked tile roof and tall fluted columns. But Greek temples weren't the first or only religious buildings in the panoply of Greek architecture: and our ideal of splendid isolation is based on today's reality, rather than the Greek model. Greek religion focused on three activities: prayer, sacrifice, and offering, and all of those were practiced in sanctuaries, a complex of structures often marked with a boundary wall (tememos). Sanctuaries were the main focus of religious practice, and they included open-air altars where burnt animal sacrifices took place; and (optionally) temples where the dedicatory god or goddess resided. 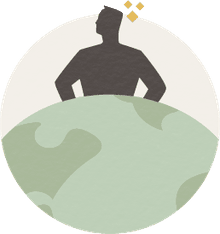 In the 7th century BC, classical Greek society had shifted governmental structure from an individual all-powerful ruler to, well, not democracy of course, but community decisions were made by groups of wealthy men. Sanctuaries were a reflection of that change, sacred spaces that were explicitly created and administered for the community by groups of wealthy men, and tied socially and politically to the city-state ("polis"). Sanctuaries came in many different shapes and sizes and locations. There were urban sanctuaries which served population centers and were situated near the market place (agora) or the citadel stronghold (or acropolis) of cities. Rural sanctuaries were set out in the country and shared by several different cities; extra-urban sanctuaries were tied to a single polis but were located out in the country to enable larger gatherings. The location of the sanctuary was almost always an old one: they were constructed near an ancient hallowed natural feature such as a cave, spring, or grove of trees. Greek religion required the burnt sacrifice of animals. Large numbers of people would meet for ceremonies that often began at daybreak and included chanting and music all day. The animal would be led to slaughter, then butchered and consumed at a banquet by the attendants, although of course some would be burnt on the altar for the god's consumption. Early altars were simply partly worked outcrops of rocks or rings of stone. Later, Greek open-air altars were built as tables as long as 30 meters (100 feet): the largest known was the altar at Syracuse. a whopping 600 m (2,000 ft) long, to enable the sacrifice of 100 bulls at a single event. Not all offerings were animal sacrifices: coins, clothing, armor, furniture, jewelry, paintings, statues, and weapons were among the things brought to the sanctuary complex as votive offerings to the gods. Greek temples (naos in Greek) are the quintessential Greek sacred structure, but that is a function of preservation, rather than the Greek reality. Greek communities always had a sanctuary and altar, the temple was an optional (and often later) add-on. The temple was the residence of the dedicatory deity: it was expected that the god or goddess would come down from Mount Olympus to visit from time to time. Temples were a shelter for cult images of the deity, and at the back of some temples a large statue of the god stood or sat on a throne facing out to the people. Early statues were small and wooden; later forms grew larger, some made of hammered bronze and chryselephantine (a combination of gold and ivory on an inner structure of wood or stone). Truly colossal ones were made in the 5th century; one of Zeus sitting on a throne was at least 10 m (30 ft) tall. In some places, like on Crete, temples were the location of ritual feasting, but that was a rare practice. Temples often had an internal altar, a hearth/table on which animal sacrifices could be burnt and offerings placed. In many temples, there was a separate room to store the most expensive offerings, necessitating a night watchman. Some temples actually became treasuries, and some treasuries were built to look like temples. Greek temples were extra structures in sacred complexes: all of the functions that they included could be afforded by the sanctuary and altar on their own. They were also specific dedications to the god, financed partly by the wealthy men and partly by military successes; and, as such, they were the focus of great community pride. Perhaps that's why their architecture was so sumptuous, an investment in raw materials, statuary, and architectural planning. The famous architecture of Greek temples is typically categorized in three genera: Doric, Ionic, and Corinthian. Three minor orders (Tuscan, Aeolic, and Combinatory) have been identified by architectural historians but are not detailed here. These styles were identified by the Roman writer Vitruvius, based on his knowledge of architecture and history, and existing examples at the time. One thing is for sure: Greek temple architecture had antecedents beginning in the 11th century BC, such as the temple at Tiryns, and architectural forerunners (plans, tiled roofs, columns, and capitals) are found in Minoan, Mycenaean, Egyptian, and Mesopotamian structures earlier than and contemporaneous to classical Greece. According to Vitruvius, the Doric order of Greek temple architecture was invented by a mythical progenitor named Doros, who probably lived in the northeastern Peloponnese, perhaps Corinth or Argos. The Doric architectural genus was invented during the 3rd quarter of the 7th century, and the earliest surviving examples are Hera's temple at Monrepos, Apollo's at Aegina, and the Temple of Artemis on Corfu. The Doric order was formed on the so-called "doctrine of petrification", the rendering in stone of what had been wooden temples. Like trees, Doric columns narrow as they reach the top: they have guttae, which are little conical stubs that appear to represent timber pegs or dowels; and they have concave flutes on the columns which are said to be stylized stand-ins for the grooves made by an adze while fashioning timber into circular posts. The most defining characteristic of Greek architectural forms are the tops of the columns, called capitals. In Doric architecture, the capitals are simple and spreading, like the branching system of a tree. Vitruvius tells us that the Ionic order was later than Doric, but it wasn't much later. Ionic styles were less rigid than Doric and they were embellished in a number of ways, including lots of curved molding, more deeply incised fluting on the columns and the bases were mostly truncated cones. The defining capitals are paired volutes, curly and downturned. The first experimentation in Ionic order was at Samos in the mid-650s, but the oldest surviving example today is at Yria, built around 500 BC on the island of Naxos. Over time, the Ionic temples became much larger, with an emphasis on size and mass, a stress on symmetry and regularity, and construction with marble and bronze. The Corinthian style arose in the 5th century BC, although it didn't reach its maturity until the Roman period. The Temple of Olympian Zeus at Athens is a surviving example. In general, Corinthian columns were more slender than Doric or Ionic columns and had either smooth sides or exactly 24 flutes in a roughly half-moon cross-section. The Corinthian capitals incorporate elegant palm leaf designs called palmettes and a basket-like form, evolving into an icon that referenced funeral baskets. Vitruvius tells the story that the capital was invented by the Corinthian architect Kallimachos (a historic person) because he had seen a basket flower arrangement on a grave that had sprouted and sent up curly shoots. The story was probably a little bit baloney, because the earliest capitals are a non-naturalistic reference to the Ionian volutes, as curvy lyre-shaped decorations. The main source for this article is the highly recommended book by Mark Wilson Jones, the Origins of Classical Architecture. Barletta BA. 2009. In Defense of the Ionic Frieze of the Parthenon. American Journal of Archaeology 113(4):547-568. Cahill N, and Greenewalt Jr., CH. 2016. The Sanctuary of Artemis at Sardis: Preliminary Report, 2002-2012. American Journal of Archaeology 120(3):473-509. Carpenter R. 1926. Vitruvius and the Ionic Order. American Journal of Archaeology 30(3):259-269. Coulton JJ. 1983. Greek architects and the transmission of design. Publications de l'École française de Rome 66(1):453-470. Jones MW. 1989. Designing the Roman Corinthian order. Journal of Roman Archaeology 2:35-69. Jones MW. 2000. Doric Measure and Architectural Design 1: The Evidence of the Relief from Salamis. American Journal of Archaeology 104(1):73-93. Jones MW. 2002. Tripods, Triglyphs, and the Origin of the Doric Frieze. American Journal of Archaeology 106(3):353-390. Jones MW. 2014. Origins of Classical Architecture: Temples, Orders, and Gifts to the Gods in Ancient Greece. New Haven: Yale University Press. McGowan EP. 1997. The Origins of the Athenian Ionic Capital. Hesperia: The Journal of the American School of Classical Studies at Athens 66(2):209-233. Rhodes RF. 2003. The Earliest Greek Architecture in Corinth and the 7th-Century Temple on Temple Hill. Corinth 20:85-94.